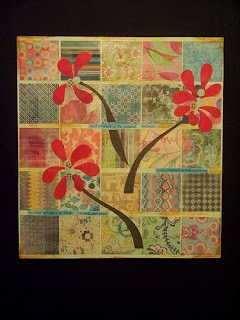 I frequent a site called www.oneprettything.com that is full of ideas..new ideas..DAILY from the blog world of crafters. Some are large projects, some very small and easy. But this project and the artists collection of art has inspired me to try to do something similar. I've lost her website. So I apologize...if you know where or who she is, please let me know! I want to give credit where credit is due! 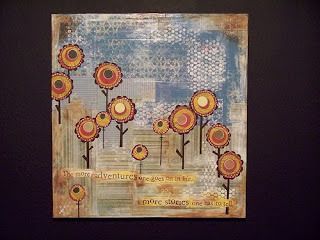 Anyway, she uses acrylic paints, stamps, and scrapbook paper...and her amazing talent to make beautiful art for the home! This is soooo on my list to do while I'm most likely going to be laid up after reconstructive surgery on my ACL. Lovely I know...but honestly! Looking forward to some time to do what I can at home and not be rushed with schedules!